The Sterling 825 sedan was an interesting (perhaps desperate) attempt at re-introducing Rover cars to the North American market, but with different branding than the brutally unsuccessful Rover 3500 hatchback sedan from 1980. 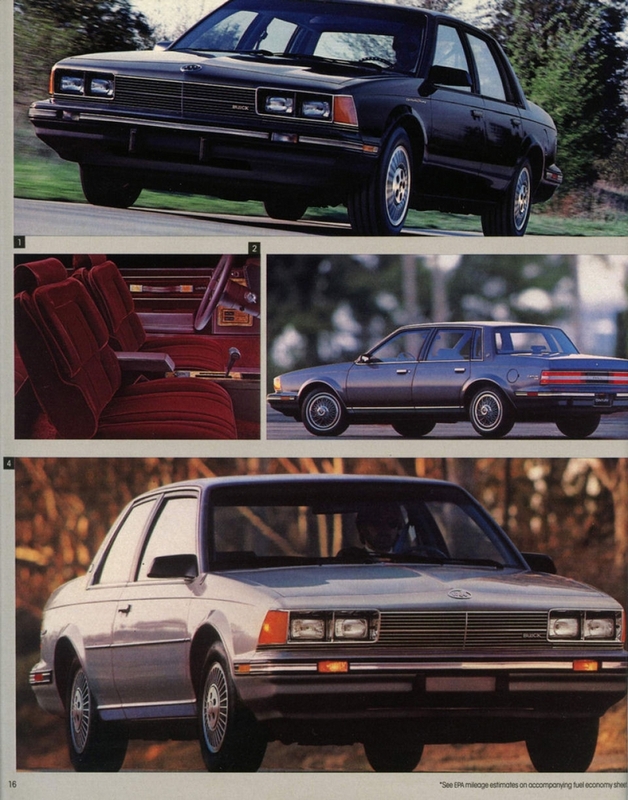 Based on the same platform as the acclaimed Acura Legend, the Sterling featured an angular exterior design and an interior with traditional British luxury cues such as Connolly leather seats and burled walnut trim. On the exterior, only the door handles were obviously shared between the Acura and the Sterling. A Honda-built 151 bhp 2.5 liter/152 ci V6 with fuel injection combined with a five-speed manual transmission yielded mpg ratings of 18 city /24 highway by the standards of the day (16/22 by modern standards). The four-speed automatic transmission dropped mpg incrementally to 17 city/23 highway. The $19,200 (about $30,700 in today’s dollars or about $6,000 less than the price of a base 2019 Jaguar XE sedan) 825 S came with remote locking, power rack-and-pinion steering, power brakes, and 195/65R15 tires (a size still readily available) on 15-inch alloy wheels. Inside, air conditioning, power windows, an electric moonroof, cruise control, velour cloth seats, and a Phillips AM/FM stereo cassette with six speakers were all included. Moving up to the $23,900 (about $38,200 in 2018 dollars) 825 SL added a four-speed automatic transmission, Bosch anti-lock brakes, a trip computer, leather upholstery with a heated driver’s seat, and an eight-speaker stereo. Advertised as “The inevitable British road car.” Sterling sold 14,171 units of the 825 in the 1987 model year—not a bad debut. But, trouble was brewing; in an attempt to generate more jobs in the United Kingdom, Rover had decided to use Lucas electronic systems instead of those from Honda. Predictably, those electronics weren’t reliable, and there were also issues with the interior plastics and the exterior paint. Finally, rust came much too quickly. All this meant that sales dropped rapidly. In 1988, only 8,901 were sold, and every year following things got worse. In August 1991, Sterling announced they were leaving the North American market after selling a total of about 35,000 cars over five years. In 2018, the Sterling 825 rarely comes up for sale in the Hemmings Motor News classifieds or on eBay Motors. I haven’t seen one in many years, but I believe I’d still notice that handsome styling if I did. Make mine silver, I think. For the last few weeks, there’s been a white Buick Century sedan parked outside one of my local supermarkets. Followers of Eighties Cars know that is likely to generate a blog entry. For 1986, Buick’s Century gained a new slanted grille along with lower profile headlamps. The other major news was the T Type coupe had been discontinued, though the sedan version remained alive. Both the sedan and the coupe were available in Custom (base) and Limited trim, while the wagon was available in Custom (base) and Estate versions. We’ll concentrate on the sedan in this post. Standard power on the Century remained the Iron Duke 92 bhp 2.5 liter/151 ci inline four with throttle-body fuel injection. Two different V6 engines were available: a $435 112 bhp 2.8 liter/181 ci V6 with a two-barrel carburetor and a $695 150 bhp 3.8 liter/231 ci V6 with sequential fuel injection. A three-speed automatic transmission was standard with the 2.5 liter inline four and 2.8 liter V6, but buyers could add a four-speed automatic for an additional $175. With these three engines, two transmissions, and curb weights in the 2,750 to 2,850-pound range, there was a wide variance in performance. 0-60 mph with the inline four/three-speed automatic combination was about 13.5 seconds, while 3.8 liter/231 ci V6 owners with the four-speed automatic could expect to get from 0-60 in about 10 seconds. Mileage with the base four and three-speed automatic was 22 city/32 highway (19/29 by today’s standards) while owners of the top-of-the-line V6/four-speed automatic combination could expect 19 city/29 highway (17/26 by 2018 standards). With a 15.7-gallon fuel tank, Century V6 drivers could expect a range of between 305 and 340 miles with a 10% fuel reserve. Standard equipment on the $10,228 Century Custom (about $23,800 in 2018 dollars—just slightly under what a 2019 Regal Sportback goes for) included front-wheel drive, power rack-and-pinion steering, power front disc/rear drum brakes, and 185/75R14 tires (a size still available from Hankook) on 14-inch wheels. Inside, a cloth notchback front bench seat and a Delco AM radio with dual front speakers and a fixed antenna were included. Moving up to the $10,729 Limited (about $25,000 in today’s dollars) added 55/45 notchback velour seats and a hood ornament. The relatively rare $13,714 T Type (about $31,900 in 2018 dollars) included the 3.8 liter/231 ci V6 and four-speed automatic combination, along with a Gran Touring suspension and 215/60R14 tires on 14-inch aluminum wheels. Inside, a sport leather-wrapped steering wheel, a full length storage console, and reclining cloth bucket seats were included. Century buyers had many choices to personalize their sedan. Optional exterior and mechanical equipment included aluminum wheels ($199), tinted glass ($115), and engine block heater ($18). Inside, air conditioning ($750), cruise control ($175), Twilight Sentinel ($57), power windows ($270), and six-way power driver’s seat ($225) were available. Century page from the 1986 Buick full-line brochure, linked from the Old Car Manual Project’s amazing brochures pages. The 1986 Buick Century sedan sold rather well—sales inched up slightly from 1985 as Buick moved about 232,000, with 5,286 being the T Type version. I think of these A-body cars as basic and honest. Centurys sometimes show up for sale in the Hemmings Motor News classifieds or on eBay Motors. Make mine dark blue metallic. I’ve been on a Riviera kick recently, brought on (no lie!) by the appearance of a 1965 model in a Hallmark Movies & Mysteries movie a couple of days ago. I covered the 1984 T-Type a few years ago—here’s the 1980 S TYPE. In its second year, Buick’s sixth-generation Riviera gained little but revised body mounts and new side mirrors with a notably more integrated look. Buick continued to offer Riviera fans a slightly more sporty S TYPE version, returning to a theme first present with the 1965 Riviera Grand Sport. The S TYPE‘s standard powertrain was the LD5 170 bhp 3.8 liter/231 ci V6 with turbocharger and a Rochester M4ME four-barrel carburetor paired with a Turbo Hydra-matic automatic transmission. The LG4 155 bhp 5.7 liter/350 ci V8 with a Rochester M4ME four-barrel carburetor was optional (it was standard on the base Riviera). The S TYPE was spritely for a big (3,633 pound) coupe by 1980 standards, but not fast: 0-60 came in about 11 seconds, which compared well with the Cadillac Eldorado, [Chrysler] Imperial, Lincoln Continental Mark VI, and Oldsmobile Toronado. Fuel mileage was rated at 16 city/23 highway by the (rather unrealistic) standards of the day—with a 21.2-gallon fuel tank, range was about 305 miles with a 10% fuel reserve. The $11,823 S TYPE (about $39,800 in 2018 dollars, or about what a 2019 Buick LaCrosse Sport Touring sedan goes for) came with amber front park and turn signal lenses, tungsten-halogen high-beam headlights, dual remote black mirrors, and GR70-R15 tires (equivalent to P225/70R15, which is still a readily available size) on 15-inch wheels with Designer’s Sport wheel covers. Inside, cloth or vinyl bucket seats, sport steering wheel, storage console, and black-trimmed instrument panel were all standard. The 1980 S TYPE also included a Rallye ride-and-handling suspension with larger front and rear stabilizer bars and stiffer shock absorbers. Standard exterior and mechanical features on all 1980 Rivieras included front-wheel drive, four-wheel independent suspension, automatic level control, Soft Ray tinted glass, power steering, and power front disc/rear drum brakes. Inside, every Riviera had air conditioning, electric door locks, power windows, a driver’s-side 6-way power seat, and an AM/FM stereo radio with automatic power antenna. Exterior and mechanical options included four-wheel disc brakes ($222), electric rear window defogger ($109), and the Astroroof ($1,058). Inside, automatic air conditioner ($150), Cruise-Master speed control ($118), Twilight Sentinel ($51), a passenger-side 6-way power seat ($179), and leather with vinyl bucket seats ($360) were all available. You couldn’t get the tilt and telescoping steering column on an S TYPE, but you could get a tilt only steering column ($83). Sales of the S TYPE were decent in 1980—with 7,217 made, it accounted for about 15% of overall Riviera sales. For 1981, the Riviera S TYPE was supplanted by the T-Type. S TYPE pages from the 1980 Buick Riviera brochure, linked from the Old Car Manual Project’s amazing brochures pages. Folks are collecting the sixth generation Rivieras—there’s robust discussion and support on the AACA’s Buick Riviera page, which is affiliated with the Riviera Owners Association. S TYPEs also come up for sale every once in a while in the Hemming’s Motor News classifieds or on eBay Motors, though there aren’t any right now. As I write this in November 2018, there is a “civilian” 1980 with a white exterior, burgundy leather seats, a V8, and 19,000 miles for sale on Hemmings, asking $11,500. According to Hagerty’s valuation tools, all the money for a 1980 Riviera in #1/Concours condition is $11,800, with a more normal #3/Good car going for a mere $4,000. Make mine the extra-cost ($186) Gray Firemist, please. I love those Buick color names and believe everyone should have at least one Firemist. For 1988, Cadillac’s Eldorado gained a new 4.5 liter V8, along with a power dome hood, a revised grille, a reshaped rear window treatment, and an extended trunk. Length increased by three inches, and the 1988 Eldorado looked a little bit more like the Eldo people had grown to expect. The Eldorado’s powertrain was Cadillac’s 155 bhp HT series 4.5 liter/273 ci V8 with throttle body fuel injection paired with a four-speed automatic transmission. Acceleration improved notably—the Eldorado’s 0-60 mph time was now under 10 seconds for the first time since the early 1970s. Fuel economy was 17 city/24 highway by the standards of the day (15/22 by today’s standards). With an 18.8-gallon fuel tank, an Eldorado owner could expect a range of between 315 and 345 miles with a 10% fuel reserve. So, what did those buyers get with their $24,891 (about $52,600 in today’s dollars or about what a loaded 2019 ATS coupe goes for) 1988 Eldorado? Standard exterior and mechanical equipment included front wheel drive, a four-wheel independent suspension, power-assisted rack and pinion steering, power four-wheel disc brakes, and 205/70R14 tires (a size still readily available) on 14-inch aluminum wheels. Inside, six-way front power seats, a leather-trimmed steering wheel with tilt and telescope adjustment, cruise control, power side mirrors, power windows, power door locks, electronic climate control, Twilight Sentinel, and an AM/FM stereo radio with power antenna were all included—the Eldorado was pretty well equipped. Moving up to the Biarritz (almost always the top if the line Eldorado since 1956) added wire wheels, two-tone paint, nicer front seats with power lumbar support and power recliners, and real walnut trim on the instrument panel, console, and door trim plates. Options included anti-lock brakes, touring suspension with 15-inch aluminum alloy wheels, Astroroof, a nicely integrated cellular phone, and Delco/Bose Symphony Sound System. Eldorado page from 1988 Cadillac brochure, linked from the Old Car Manual Project’s amazing brochures pages. The exterior redesign and the new engine definitely assisted sales—they were nearly double what they had been in 1987, though still not close to the salad days of 1985 and prior. According to Hagerty’s valuation tools, all the money for a 1988 Eldorado in #1/Concours condition is $9,800, with a far more typical #3/Good car going for a mere $3,500. Eldorados of this age come up for sale often in Hemmings Motor News, so folks are saving them. As I write this in November 2018, three 1988 Eldorados are for sale, with prices ranging from $5,000 to $11,900. The Merkur XR4Ti never had a chance. There, I’ve said it. Though the redoubtable Bob Lutz was involved, I can’t even imagine the combination of decisions that made Ford think that selling a Karmann-assembled version of the European Ford Sierra at Lincoln-Mercury dealers in the mid-1980s was ever going to work out. By early 1989, the XR4Ti was gone. Because the Cologne 2.8 liter V6 the Sierra used in Germany could not clear US emissions, the engine the XR4Ti received was Ford’s Lima 2.3 liter/140 ci turbocharged and fuel injected inline four also seen in the Ford Mustang SVO and Ford Thunderbird Turbo Coupe. In its Merkur guise, it made 175 bhp with the standard five-speed manual transmission and 145 bhp (ouch!) with the optional ($427) three-speed automatic transmission. 0-60 mph came in about 9 seconds with the manual, and top speed was a little under 130 mph. Fuel economy wasn’t very good: with the manual, it was 19 city/24 highway by the standards of the day (17/22 by today’s standards). With a 15.1-gallon gas tank, a Merkur owner could expect a range of 265 to 290 miles with a 10% fuel reserve. Base price for the 1985 XR4Ti was $16,361 (about $39,200 in 2018 dollars). Standard exterior and mechanical features included flush headlamps, power front disc/rear drum brakes, nitrogen pressurized shock absorbers, variable ratio power rack-and-pinion steering, and the famous (and polarizing) biplane rear spoiler derived from the one on the Probe III concept car Ford had shown in 1981. Pirelli P6 195/60HR14 tires (a size still readily available) were fitted on 14-inch “phone dial” wheels. Inside, standard equipment included air conditioning, variable ratio power steering, power mirrors, a 60/40 folding rear seat, and an AM/FM stereo with cassette player. Options other than the automatic transmission were relatively few: a $470 Convenience group (power door locks, power windows, and cruise control), tilt/slide moonroof ($549), leather seats ($890), heated seats ($183), and metallic paint ($274). According to Hagerty’s valuation tools, all the money for a 1985 Merkur XR4Ti in #1/Concours condition is $6,500, with a more normal #3/Good car going for $2,400. I find it interesting that Hagerty tracks them at all—there are many of what I think would be equally interesting cars that they don’t track. You rarely see them for sale in the Hemming’s Motor News classifieds—they are at least a little more common on eBay Motors. Make mine Paris Blue Metallic with the optional Gray leather interior, please. The real question is how many are left. The Toyota Camry debuted in the middle of the 1983 model year, in four-door sedan and five-door hatchback models. 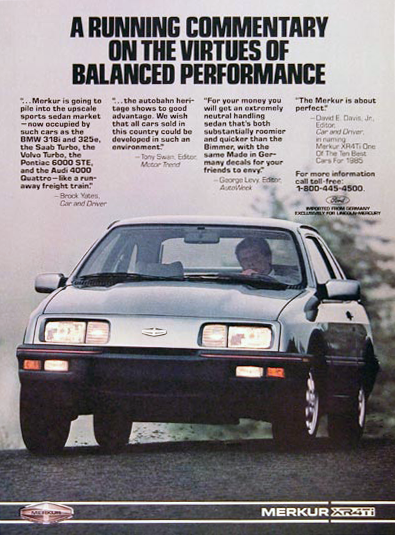 Instead of being designed to compete with European manufacturers, the Camry was designed to compete with American cars—in fact, Car and Driver famously wrote that “the Camry drives as if Buick engineers had moonlighted on its development.” The Camry’s measurements ended up splitting the difference in size between the GM J-body (Buick Skyhawk, Cadillac Cimarron, Chevrolet Cavalier, Oldsmobile Firenza, and Pontiac 2000) and the GM X-body (Buick Skylark, Chevrolet Citation, Oldsmobile Omega, and Pontiac Phoenix). Power for the first-year Camry was provided by a 92 bhp 2.0 liter/122 ci inline four with fuel injection, which was available with either a standard five-speed manual or an optional four-speed automatic. With the manual, 0-60 mph came in a little under 13 seconds in the 2,236-pound car. Mileage was good—32 city/44 highway by the standards of the day (25/31 by modern standards). With a 14.5-gallon gas tank, a Camry owner could expect a 365 to 495 mile range with a 10% fuel reserve. Standard equipment on the $7,988 (about $20,000 in today’s dollars—a 2018 Camry starts at $23,500) DLX sedan included front wheel drive, a four-wheel independent suspension, and 185/70R13 tires (a size still available from Kumho and Vredestein) on 13-inch wheels. Upgrading to the $9,698 LE made the four-speed automatic standard and added variable-effort power steering, rear window defogger, dual remote side mirrors, full instrumentation, reclining cloth bucket seats, and an AM/FM stereo radio with five speakers. Individual options were relatively few and included air conditioning, sunroof, and a cruise control/power locks/power windows package. The first-generation Camry was well received and got good reviews—the tagline in Car and Driver‘s test was “At home in America.” 52,651 were sold in that first model year, with sales increasing steadily throughout the decade. Unlike other Toyotas that are deemed more collectible from the eighties (Land Cruisers, pickup trucks, Celicas, Supras, MR2s), first-generation Camrys rarely come up for sale for sale in the Hemming’s Motor News classifieds or on eBay Motors. The Grand Prix was all new for 1988. Gone was the elderly G-body rear-wheel-drive (dating from 1978), replaced by an aerodynamic front-wheel drive W-body. For 1988, the standard Grand Prix powertrain was the LB6 130 bhp 2.8 liter/173 ci V6 with fuel injection paired to a four-speed automatic (a five-speed manual was available). With a curb weight of 3,038 pounds, 0-60 took a little over 10 seconds with the standard powertrain. Mileage with the same powertrain was 20 city/29 highway by the standards of the day (18/26 by today’s standards). A 16.0-gallon fuel tank meant that a Grand Prix owner could expect a range of between 315 and 355 miles with a 10% fuel reserve. The 1988 Grand Prix came in base, LE, and SE forms. Standard exterior and mechanical equipment in the $12,539 base coupe (about $27,300 in today’s dollars) included composite halogen headlamps, dual sport mirrors, power steering, four-wheel power disc brakes, an independent rear suspension, and P195/75R14 tires (a size still available from multiple vendors) on 14 x 6 inch wheels with custom wheel covers. Inside, notchback front bench seats, an electronic digital speedometer, a glove box with a combination lock, and an AM/FM stereo radio were included. Moving up a little to the $13,239 LE added power windows with illuminated switches, lamp group, 40/60 split reclining pallex cloth seats, rear folding armrest with pass through to the luggage compartment, and mechanical analog gauges with tachometer and trip odometer. The top-of-the-line $15,249 SE (about $32,300 in 2018 dollars) added the Y99 Rally Tuned suspension, dual exhaust system, and P215/65R15 tires on 15-inch aluminum wheels and switched the standard transmission to a five-speed manual. Inside, air conditioning, leather-wrapped tilt steering wheel, cruise control, power cloth front bucket seats with three-position lumbar controls, and rear bucket seats were all part of the SE experience. Options included power door locks, an electric rear window defogger, a power antenna, and a UX1 AM stereo/FM stereo radio with seek, scan, auto-reverse cassette, five-band graphic equalizer, and digital clock. 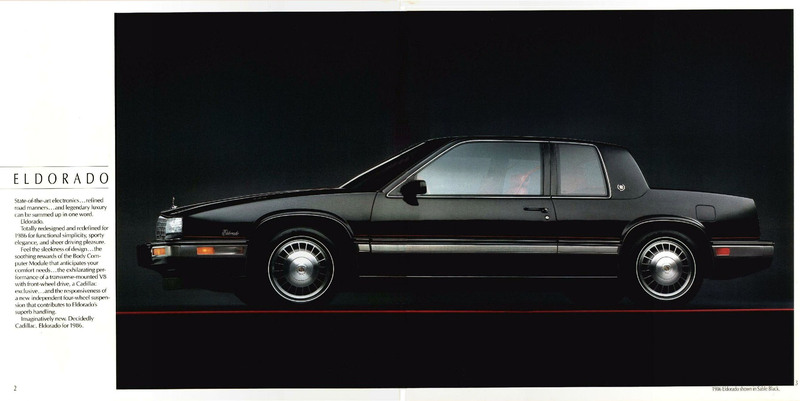 The 1988 Grand Prix was relatively well received—it was Motor Trend‘s Car of the Year, and Pontiac sold 86,357 cars in slightly over half a model year (sales only began in January 1988), which marked more than five times as many as the last of the G-body versions in 1987. For 1989, sales would top 136,000 and would stay over 100,000 for every year through 1995. Grand Prix’s of this generation are rarely seen in the Hemming’s Motor News classifieds and on eBay Motors. Sometimes you do see the ASC/McLaren or GTP versions, but rarely the “civilian” models.